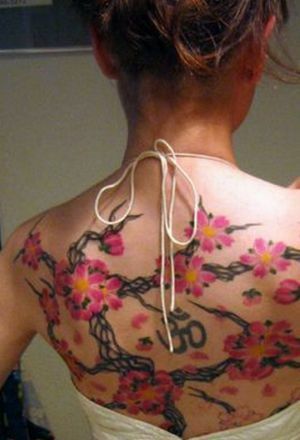 Cherry blossom tattoos are quite popular tattoo designs among the young ladies. The cherry blossom tattoos are not just beautiful to look at, but they also represent power, delicacy and mystery. What really sets this cherry blossom tattoo apart is the Hindu âOmâ symbol in the center. The chick seems to be totally into the symbolic significance involved with this tattoo as she has got it inked on her entire back.